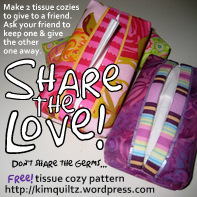 To read the original blog post about the “Share the Love!” campaign and the tissue cozies, go HERE. To download the PDF printable, 2-page version of the Travel-sized Tissue Cozy Pictorial Patter, go HERE. Push those seam allowances towards the outside edges as you iron, it’ll give your cozy a little extra structure and stability. An easy way to find the center is to fold it in half (accent strips parallel) and finger press yourself a guideline down the middle. Then open your cozy-2-be and fold in each side to the finger pressed line. Love the idea! Love the project! Very addicting. I plan to make many and spread your great idea! Thanks so much! I look forward to trying this out with some of my left over fabric pieces! I see in your profile that you live in the PNW. I am currently in Bellingham, WA. Thanks for the fun idea! Thank you! May I call you Wart for short? (oooo, bad pun!) Yes, I live deep in the PNW, east of Chehalis. Bellingham is sooo beautiful. I’ve been up there for a conference and got to see whales spouting off for the first time there. So cool! Thanks, Kim. 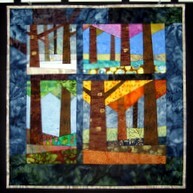 It was great seeing you on Sunday at Art Quilt Group. I need to make a bunch of these for gifts. Great pattern!!! Great idea to help us all prevent the flu in a colorful and cheerful way. Thanks for sharing. Have a great day. Love the gift idea – will be making some of these this weekend, thanks to your great instructions! I’ll be able to use up some of my scrap stash, too! 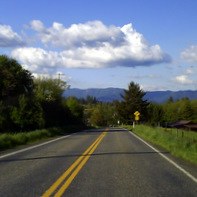 What part of the Pacific NW are you? I’m in Salem, Oregon. Hope you’re having a happy Thanksgiving! You are so welcome! Howdy neighbor in Oregon! I live east of the Chehalis/Centralia area towards White Pass. I DID have a happy Thanksgiving, I hope you did too. Let me know how your tissue cozies go over…. Kim, I gave my first set away to the wonderful tech at my pharmacy. You would have thought I gave her a million dollars. I made tags to go with them. Thanks so much! Thank you for the tutorial. Eveyone is going to get one in their stocking this Christmas. Wonderful idea. I would like you to follow along and maybe participate in the metal frame purse project I am starting. I have no idea what I am doing, so appreciate suggestions or sites. Hi Kim, is there any way I can just print out the instructions for this handy little kleenex cover? What a wonderful idea! Love the share the love thing. Thanks for sharing it with us! Yay! So glad to meet you. I had a look see at your blog and have subscribed. I really feel like I’ve been there before, so if I’ve loved and lost then, by golly, I’ve found you again and won’t lose you this time! Thank heavens for the Google Reader! My friend Margaret and I love this idea. 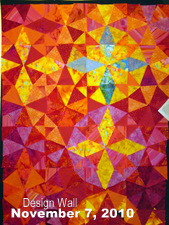 We have made one hundred to be given away at the Canberra Quilters “Biggest Morning Tea” event later this month. The “Biggest Morning Tea” is a Cancer Council initiated umbrella event in Australia, during May, to raise funds for cancer research. Organisations and workplaces each hold their own morning tea and donations go to the Cancer Council. We have slipped some info into each cozy to point out where the idea and the instructions have come from. Thanks to you for the great idea and the instructions! OMGoodness! How wonderful!!!! Is there a link where we can all go see what you all are up to? What a delightful pair you must be!! 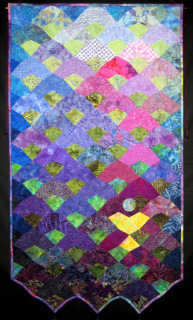 Iwas shown this project in quilt camp last year and needed to be taught again. Thanks for putting this post up. Posts via email are easier to read (light background, larger print) and faster to load (smaller file size). Go see what's on My Design Wall today. Here you can see how I build a project, from start to finish, on my design wall. The pictures that I take along the way provide the bread crumb trail I use to get back on the path when I've gone astray. 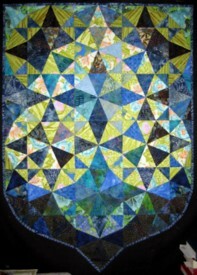 They also provide a different perspective and a distancing to my own work. I'm a 49 year old Quilter, Episcopalian , and Lover of Words. I'm of mixed heritage (1/2 Ozark Hillbilly, 1/2 Southern Belle), I live in the Pacific NW and I love to talk about my family, quilting and country living. Oh, and I'm SINGLE (in case you're wondering). I am a freelance writer, outdoors columnist and photojournalist who loves meeting people while they are doing what they love and listening to them talk about their passions. I live a Creative, Joy-filled Life in love with God, all creation and my neighbor (that means you). It's my vocation. I hope that one day, if I practice long and hard enough, I might get good at it. I WOULD LOVE for you to leave me a comment or you can send me an email. Visit my online photo gallery. 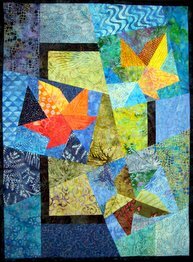 See the Quilt Show, Family Photos, Around the Farm, Church Family Photo Galleries and more! As much as I would like to believe that I am original or different, "There is nothing new under the sun." (Ecclesiastes 1:9). The road that I am on is a road that many other people have traveled before me. That fact gives me comfort, it humbles me and it reminds me that I am most certainly not alone on my journey.